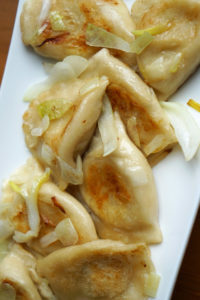 Pierogi are delicious dumplings with sweet or savoury filling, cooked in boiling water. In Poland, they’re considered a classic, top comfort food and a national dish. Where Do Pierogi Come From? Are They Polish? 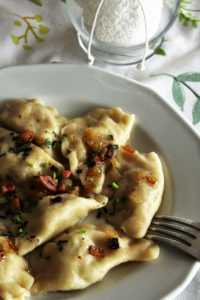 It might seem that pierogi are present in Polish cuisine since forever. This is not contrary to the truth – it is believed that they appeared on our tables in the 13th century thanks to Saint Hyacinth (Święty Jacek or Jacek Odrowąż), who brought them to us from Kiev. In China – the homeland of dumplings – they were known much earlier. Chinese dumplings are called “Jiaozi” and they’re traditionally stuffed with vegetables or ground meat. They were also prepared as a dessert – filled with nuts and enjoyed during the New Years celebrations, promising to bring good luck in the following months. 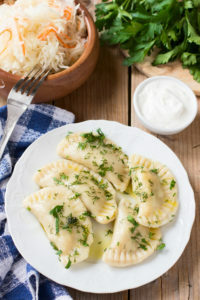 Filled dumplings were also known in Italy – it is believed that the original recipe was brought to Italy by Marco Polo. The Italians did not use the original recipe, but used it as their inspiration to create much loved ravioli and tortellini. Although eating filled dumplings is a custom known in many countries, each of them has a unique character and is prepared in different way. Which dumplings are typically Polish? Definitely pierogi ruskie! 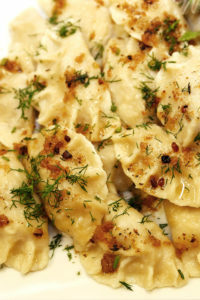 Despite the name (“ruskie” means “ruthenian”, not “Russian”), the Russians do not know this way of stuffing dumplings. The name lost its original meaning after the war, as our grandparents and great-grandparents referred to Ukraine as Ruś (“Ruthenia Rubra”) and that’s where these goodies came from. “Ruskie” are usually filled with farmer’s cheese and potatoes with fried onions and spices. The dough is rolled out to a thickness of about 2 millimeters (roughly 0.08 inches), the stuffing is covered with dough and boiled in water. The dish is served with pork scratchings, fried onions or sour cream. In many Polish homes, they’re sautéed in butter after boiling – for an extra, crispy texture. Traditional pierogi dough is a combination of flour, water, salt and oil. Sometimes whole eggs or yolks are added, making the dough richer, but less flexible. When making dessert pierogi with sweet filling, replace half of the water with whole milk. Ready to give it a go? 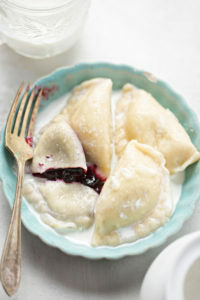 Try our most popular pierogi dough recipes. Depending on filling of your choice, pierogi could act as a proper lunch/dinner, or as an indulgent dessert. They also have their place on the Christmas Eve table, filled with wild mushrooms and sauerkraut. Boil: The best way to cook pierogi (or at least the most popular) is to boil them. Bring a large pot of lightly salted water to a boil. Add pierogi and cook for 5-6 minutes until they start to float to the top. Remove with a slotted spoon. Sauté (pan fry) Sautéing adds crispness to the texture. You’ll need to have them boiled first if they were frozen and uncooked. Bake Preheat the oven to 200°C/400°F. Brush pierogi lightly with a coat of melted butter. Place in the oven for 15-20 minutes – turning them once mid-bake. 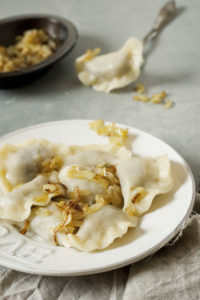 To learn more about the techniques, check out my How To Cook Pierogi? guide. The most popular pierogi sauce (which tastes great with any savoury filling) is simply melted butter with caramelised onion. The recipe is simple: sauté chopped onion in butter until it becomes soft and starts to brown. Melted butter & breadcrumb topping: melt butter on a frying pan, add breadcrumbs gradually until a desired texture is achieved. Let the breadcrumbs turn golden brown. Pour over pierogi, sprinkle with powdered sugar for additional sweetness. How long do pierogi last in the fridge? If stored correctly, it’s best to eat them within a few hours – or within the next day at latest. Stored dumplings should be reheated before consumption. The best way to store them is to place them on a standard plate. Lubricate them with a thin layer of oil to prevent them sticking. Cover with cling foil and store in temperature of 5°C/40°F or below. If stored outside of the fridge, they last up to 3 hours (in temperature of less than 10°C/80°C). If they’re store-bought, it’s best to follow the instructions on-pack. Various brands have different dough-to-filling ratio, therefore the cooking method might differ as well. Overall, the best way to cook frozen pierogi is to simply boil them first. 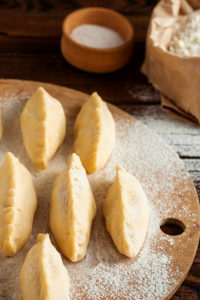 Make sure not to boil too many frozen pierogi at once, as it will reduce the temperature of the water too quickly, causing pierogi to crack as they cook. Once they start to float, remove them with a slotted spoon and then serve. Alternatively, you could proceed to sautéing them in butter with some chopped onions. How many calories in pierogi? Generally anywhere between 70-130 kcal for a single dumpling. The calorie count varies greatly depending on the size, filling and the method of cooking. If you’re calorie conscious, go for boiled instead of fried and avoid heavy toppings. I’ll update all the pierogi recipes with exact calorie count soon.